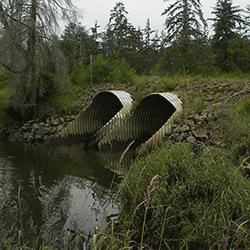 In rural southwest Washington state, new culverts replace a tide gate and reconnect a wetland to the Grays River and Columbia River estuary. More than two centuries ago, Lewis and Clark navigated a wild Columbia River—with multiple channels, wide floodplains, and connected marshes, wetlands, and estuaries. Here and along the river’s numerous tributaries, they witnessed massive salmon migrations. The picture is much different today. The once “Mighty Columbia” is channelized and fragmented, with highways, railroads, and dikes cutting off much of the river from wetlands and artificial flow controls altering historical flood patterns. Today’s salmon migrations are a mere fraction of what the Corps of Discovery marveled at so many years ago. Those tasked with restoring ecosystem functions have long understood the benefit of reestablishing spawning grounds as well as solving the migratory challenges posed by hydroelectric infrastructure. Now, in a new paper published by Ecological Applications, (“Storm-driven particulate organic matter flux connects a tidal tributary floodplain wetland, mainstem river, and estuary”), researchers have quantified another piece of the salmon restoration puzzle: the impact of reconnecting former wetlands to improve the base of a healthy aquatic food web. 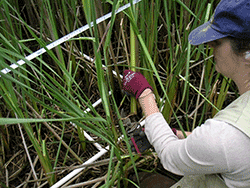 Heida Diefenderfer, a restoration ecologist based at PNNL’s Marine Sciences Laboratory in Sequim, Washington, collects marsh macrodetritus along a transect using PVC quadrats and clippers. Researchers used the dry weight of biomass collected from the wetland restoration site to calibrate a sediment-transport model. A healthy concentration of zooplankton, insects, and other larval and adult invertebrates—all favorites on a young salmon’s breakfast menu—rely on this particulate organic matter at the base of the aquatic food web. However, in developed environments like today’s Columbia, the predominant source of particulate organic matter—wetlands—is often disconnected from the main-stem river or eliminated in favor of other land uses. 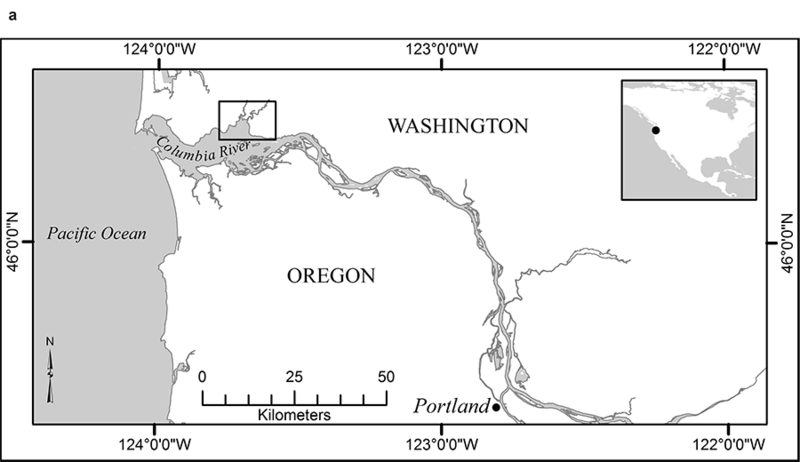 “Although it is known that rivers can export large quantities of organic matter to the coastal ocean, this research shows that restored and reconnected floodplain wetlands contribute to adjacent estuarine habitats, and play a significant role in rehabilitating estuarine food webs important to endangered salmon populations,” Thom said. The Columbia is a big river, so how can policymakers prioritize wetland restoration and reconnection? And importantly, how far away from the main-stem river can reconnected wetlands still be impactful? These are questions ecologists are now considering on a 145-mile stretch of the Columbia—from the Pacific Ocean to the Bonneville Dam, 40 miles east of Portland, Oregon. Researchers investigated the hypothesis that upon reconnecting a wetland, particulate organic matter would reach the ecosystem of the main-stem river. They adapted a numerical hydrodynamic model “by setting up the sediment transport model to estimate movements of particulate organic mass derived annually from marsh plants,” explained corresponding author Heida Diefenderfer, a restoration ecologist based at PNNL’s Marine Sciences Laboratory in Sequim, Washington. The PNNL-led research team studied particulate organic matter export from a recently reconnected wetland along the Grays River in Washington state, a tidally affected tributary near the mouth of the Columbia River. Here, modeling indicated that the Columbia Land Trust’s reconnection of its 160-acre property, located about 4.5 miles from the main-stem river, would release large quantities of organic material, primarily during storm flooding events in the autumn and early winter. Modeling demonstrated that particulate organic matter produced in a tributary wetland cumulatively affects a river as far as 4.5 miles downstream, including nearby restoration sites, and even in areas upstream from the wetland in regions affected by tidal reversal. The modeling also confirmed that new culverts, as well as flooding events, can be important conduits for the exchange and transport of organic material. And it supports the notion that restoring hydrological connections is a viable strategy for enhancing contributions to the Columbia’s food web. Restoration like this is central to the Columbia Estuary Ecosystem Restoration Program that is supported by research done by PNNL Marine Sciences Laboratory scientists. This work is finding potential applications beyond the salmon food web. As the PNNL researchers modified hydrodynamic modeling methods to measure the transport of organic matter, they believe that their work can be applied to the flow of carbon in earth system models, linking terrestrial model components to ocean components. “Exploring modeling approaches such as those demonstrated by this study can fill an important gap in understanding the role of the terrestrial-aquatic system in the global biogeochemical cycle,” explained Ruby Leung, chief scientist for the U.S. Department of Energy’s Energy Exascale Earth System Model (E3SM) project. Funding: This research was funded by the Portland District of the U.S. Army Corps of Engineers under the Columbia River Fish Project.